With the latest technology in under surface digital printing and laser cutting, GSM Graphic Arts is well positioned to produce prototypes and low volume production runs, offering fast turnarounds and without incurring tooling or origination cost. The company also offers screen printing and platen cutting, enabling it to manufacture full production runs using the most efficient process. The manufacturer of labels, nameplates and graphic overlays, believes it offers a range of materials and finishes which is second to none. 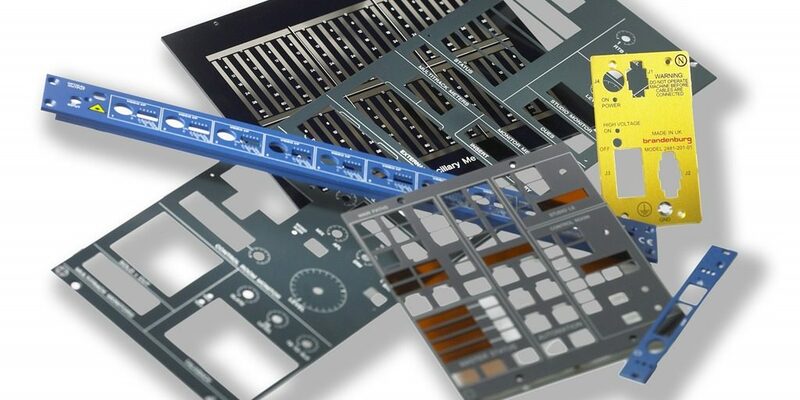 At Southern 2019 it showed samples of polyester and polycarbonate graphic overlays as well as anodised aluminium control panels. Overlays and control panels can incorporate LCD windows, secret-til-lit areas, embossed switches, clear led windows and a choice of durable finishes. A range of adhesives is available to suit the environment in which the overlays will be used. These can be selectively applied around the window and switch areas on the rear of the overlay. Materials, inks and process have been tested for UV weathering performance in accordance with ASTM G155:2006 for which the printed substrates are required to retain good colour stability for a period of at least five years. The company can guarantee that the inks will not fade and the material will not discolour within this time. The company also manufactures serial and rating plates, barcode labels, logo badges and warning labels. It has over 40 years of manufacturing experience working with a wide range of materials and processes including anodised aluminium, etched stainless steel and brass, digital and screen printing.